One of the reasons I quit smoking was because every time I went to a bar I noticed that the smokers had the most wrinkles and leathery skin. 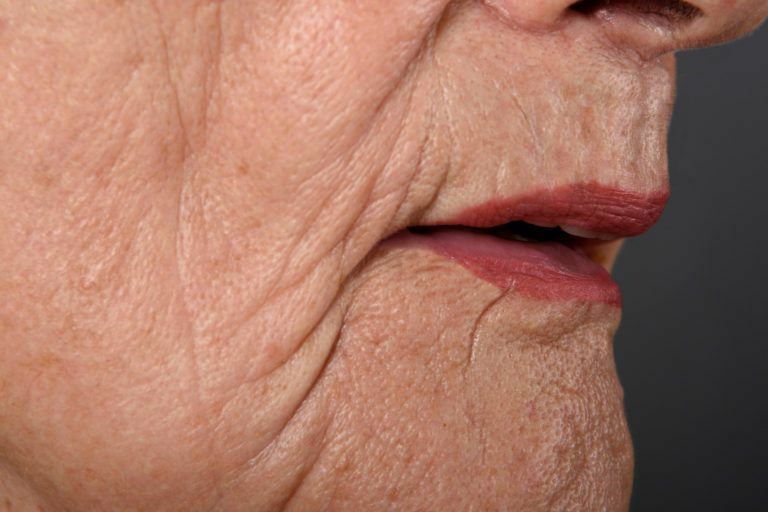 Why does smoking cause wrinkles? Because it inhibits collagen production–the substance that makes up about 70 percent of your connective tissue. It’s important stuff, that collagen, and it’s what gives your skin that elasticity that is lost over time (the primary cause of wrinkled skin). Of course, the typical smoker’s wrinkles are nothing compared to a chain smoking, tan-bed-aholic princess with bleached blonde hair. Each of us knows at least one of these women; their irrational quest for the perfect tan never ceases to amaze us, nor does the tar capacity of their lungs. However, if you’re not a smoker, there are other techniques discussed here to get rid of wrinkles. Staying out of the sun and not smoking are just two suggestions if you want to prevent premature wrinkles. If you keep reading, you will see the medical wrinkle treatments options if wrinkle prevention doesn’t do it for you, and to the right you will see natural wrinkle care options if you want to pinch some pennies instead of chasing that perfect anti wrinkle cream treatment. Right now, though, let’s talk about preventing wrinkles. If you’re serious about getting rid of wrinkles, you should stop smoking right now. Cigarettes do a number of things to your body that could cause premature wrinkles to form, like inhibiting the amount of collagen your body makes to heal wounds and repair damaged skin, which can lead to deeper wrinkles. Cigarettes also inhibit the body’s circulation, which means blood won’t reach the capillaries (minute blood vessels) in the skin on your face, which means more dead skin, wrinkles, and less color in your cheeks. None of those things lead to healthy skin, much less overall health. Staying out of the sun should help you get rid of wrinkles. If you’re a sun worshiper like myself, you’re painfully aware of how bad the sun is for your skin these days. Not only do you do a lot of squinting in the sun, producing “crow’s feet” wrinkles around the eyes, but if you’ve ever seen a man or woman who just won’t stop tanning, you’ll see what I’m talking about–their skin is like leather. Do yourself a favor and reduce wrinkles by putting on suntan lotion if you’re going to be around between the peak hours of sunlight (10:00 am – 3:30 pm), and wear sunglasses when you go out, too. Avoid strong soaps and scalding water if you want to get rid of wrinkles. A lot of people make an association between exfoliating face washes and the reduction of wrinkles. The fact of the matter is, harsh facial cleansers, hot water, and soaps that claim to get rid of wrinkles only serve to make your skin less healthy and more prone to forming wrinkles by killing the top layers of your skin and seeping the oil out of layers of skin below that. Over time, this repetitive abuse of your skin will show in the dryness of your skin and in the number and deepness of your wrinkles. A diet rich in Hyaluronic Acid may be to your ticket to get rid of wrinkles. Studies done have shown that people who ingest a large amount of hyaluronic acid (sweet potatoes are loaded HA) live longer than people who do not. Because the lack of hyaluronic acid is often times the cause of premature wrinkles, it’s safe to assume that hyaluronic supplements are an effective means to get rid of wrinkles. There are, however, some studies linking HA to cancer. So, before you go off to your local health foods shop in search of hyaluronic acid supplements, do a little research and maybe see a nutrionist or a doctor and ask them for a second opinion on this matter. Treatments that contain Hydroxy acids and moisturizing creams may help get rid of wrinkles. You have two choices for Hydroxy acids: alpha and beta. For reasons we won’t get into here, alpha hydroxy acids are best for treating sun-damaged skin that isn’t prone to things like acne. In other words, teenagers should stay away from alpha hydroxy acids, and go with beta hydroxy acids which are better for treating clogged pores, whiteheads, blackheads, and to avoid premature wrinkles. If you’re not a teen, you can try the derma E overnight peel sold at Amazon. In this millenium, skin care is all about acids to get rid of wrinkles. Most wrinkle creams these days contain something with beta hydroxy acid or alpha hydroxy acid because of it’s effectiveness in treating acne and other skin complications like sun damage, wrinkles, and scarring. Despite some of the studies suggesting that Hyaluronic acid is connected to some forms of cancer, you will probably start to see a lot more about hyaluronic acid supplements and hyaluronic acid infused wrinkle creams. Keep in mind that studies done that show people age slower on hyaluronic acid were getting their hyaluronic acids from root vegetables, part of their natural diets. But, I think, before you invest yourself in Hyaluronic acids, you should wait until more studies are done to make sure it’s safe, or at least use the milder forms of this wrinkle treatment/supplement. Retinoids are a prescription strength acid creams that exfoliate by accelerating the growth of new skin and the shedding of dead skin. Botox is a chemical that is injected into certain parts of the skin where squinting, frowning, and other repetitive facial movements can cause lines and wrinkles. Collagen (bovine collagen) is essentially a protein found in connective tissue which is used by the body to repair damaged skin. Cosmetic surgeons will often inject a small dose to help treat shallow wrinkles. Laser Surgery, also called dermabrasion or lasabrasion, is used to treat wrinkles by focusing a CO2 laser on the dead or near-dead skin cells where wrinkles have formed, tightening the skin and allowing new cells and more collagen to prosper. Cocoa butter is what we call an emollient; that is, it’s a substance that softens and helps your skin retain moisture (ie. water), thus getting rid of wrinkles by keeping your skin healthy. If you can buy the theory that dehydration causes damage to your skin and makes it more susceptible to weathering (think cowboys), then it shouldn’t be much of a stretch logically to accept the idea that moisturizing your skin with Cocoa is good for you. Coconut Oil is an emollient much like Cocoa butter. It works to get rid of wrinkles in much the same way Cocoa does. You’ll find coconut oil in a multitude of wrinkle treatments and suntan lotions, but I would suggest getting the pure stuff. It’ll make you feel exotic and healthy in that way that only organic and natural solutions can. Amazon has some good choices, like this for certified organic Cocoa Butter. Water moisturizes. It’s called The Water Cure, and basically the premise is this: drink about 1/2 your weight (by lbs.) in ounces of water. So, a person who weighs 120 lbs. should be drinking about 60 oz. of water a day, split up into 8-10 oz. glasses. This will both prevent and get rid of wrinkles.